Many successful transport operators already consider Total Cost of Ownership (TCO) to guide decisions on equipment maintenance and operational performance. This often involves monitoring ‘cost per mile’ of the vehicle fleet, on which vehicle availability, maintenance costs, and fuel expenditure all have an impact. Maintenance spend typically amounts to around 10% of total operating costs. When looking to make savings, lubricants are often one of the first areas where transport operators seek to cut costs; however, while buying cheaper oils and greases may achieve immediate cost savings, the detrimental effect on equipment can prove more expensive over time. The best value is found in choosing competitively-priced, high-quality lubricants that deliver excellent equipment protection and, in doing so, can help deliver cost savings. Download our white paper, “Power Efficient Fleets,” to learn more about how optimizing your lubrication program can reduce your cost per mile. 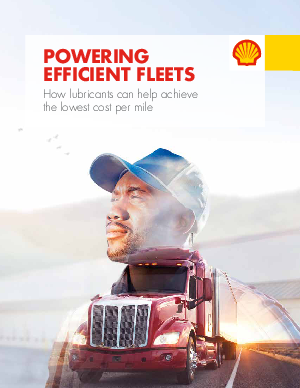 Additionally, you will find case studies that illustrate how fleet operators worldwide have successfully worked with Shell Lubricants to extract value by reducing TCO and increasing vehicle availability.